I see that yesterday you just signed up with us. We're sorry to hear that you'll be canceling your service. We will be happy to help you take care of that cancellation if you would like. Before we proceed, may we offer assistance in any way with your site or is there anything we can do to retain you as a client? We would be happy to be in touch to help you to have a successful experience with your site. Thanks for your response. I am in china, to visit my website very slow, sometimes can not open the page. You can cancel the account and give the refund. I have paid with Visa. Thanks for your reply. We're sorry to see you go, but we certainly can assist you in canceling your account. I'm sending you an email which contains a link to the cancellation form. Once you fill it out, our billing department will process your cancellation and issue you a refund. You should receive these funds within 1-5 business days. Again, if there is anything we can do to retain your business, please let us know. Thank you for your email. We're sorry to hear that you're thinking of canceling your service so soon. Was something not working right with the site or service? We have a new web-builder called Weebly that can make creating and updating a site fast and easy. We would appreciate the opportunity to help any way we can before you go, please let me know what I can do to help. Check out our Youtube channel at http://www.youtube.com/bluehost ! 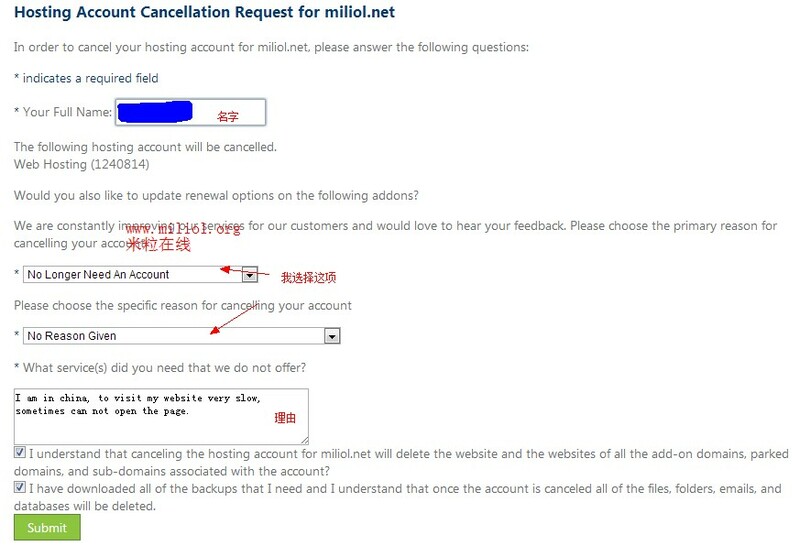 We have received a request to cancel your miliol.net hosting account. Please remember that canceling your account will remove all content, including websites, databases and email messages. You should download a copy of absolutely everything you need before continuing. Thank you for hosting with Bluehost and, should you ever need a host in the future, let us know. We're happy to help.